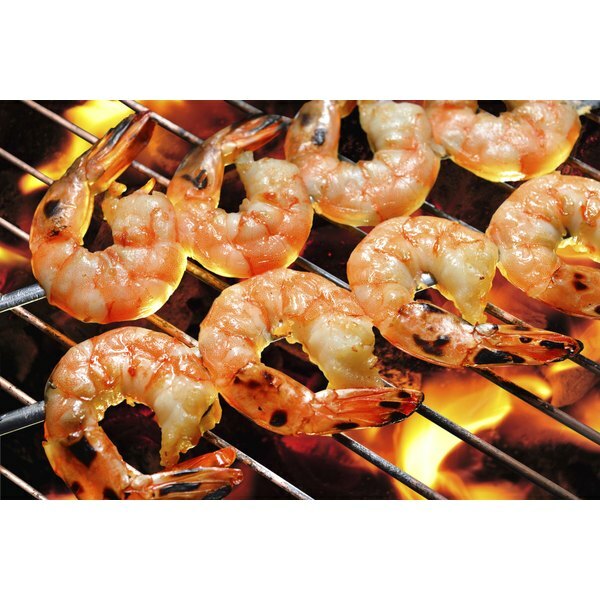 Shrimp causes an allergic reaction in as many as 2.8 percent of food sensitive individuals, according to the 2001 Internet Symposium on Food Allergens. Ingesting tropomyosin, the muscle protein found in shrimp and other crustaceans, including lobster, crab and crawfish, may be responsible for triggering symptoms ranging from mild to extremely severe. Eating food containing shrimp in various forms, such as whole shrimp and shrimp extract, is the most common cause of allergic reactions to shrimp. However, exposure to allergens in shrimp meal and dust particles containing shrimp may also cause asthma in food processing workers. Seafood restaurant workers may also suffer from shrimp allergens from inhalation of boiling water containing shrimp. Your chances of having an allergy to shrimp or any other substance is increased if your family has a history of allergies. You have a 75 percent chance of developing a food allergy if both parents have one; a 30 to 40 percent chance if one parent has an allergy and a 10 to 15 percent chance if neither parent has allergies. The more exposure you have to shrimp, either by consumption or by working in the seafood industry, the higher the chance you will experience an allergy. Once an individual is sensitized to a shellfish allergen, the allergy will likely persist for life. Although the response time for an allergic reaction to shrimp varies, 88 percent of people experience symptoms within an hour after ingestion. These include skin symptoms, such as itching, hives and eczema; oral allergic syndrome, such as tingling or swelling of the mouth; respiratory symptoms, including wheezing; abdominal pain, fainting, nausea and even potentially fatal anaphylaxis. A study at the Sagamihara National Hospital in Japan observed two anaphylactic shock cases from tropomyosin in a group of children and adolescents. Among 99 shrimp-allergy cases, 65 percent also showed a positive reaction to crab and 18 percent reacted to squid. If you experience unpleasant reactions after eating shrimp, you should confirm suspicions before assuming a food allergy. An allergist can conduct a skin test by exposing the skin to proteins found in shrimp and measure the reaction. A food that is positive for sensitivity will cause a red bump. Allergen-specific blood tests can measure the antibody response to shrimp in the bloodstream. Because an allergy to shrimp may also indicate an allergy to crab, the best way to prevent an allergic response is to avoid these shellfish. International regulations require mandatory labeling of crustacean products on packaged food. However, be aware of the potential danger of restaurant food. The chicken and French fries you order may be fried in the same oil as shrimp. Some foods may contain shrimp, such as bouillabaisse, fish stock and those using natural and artificial seafood flavoring. Cleveland Clinic; Diseases and Conditions; Shellfish Allergies; What are the Symptoms? If You Are Allergic to Shellfish Can You Take Pills With Iodine? Can You Eat Turkey if You're Allergic to Chicken?